Adapted from Montana State University. some of the groundwater contamination cannot be reversed. 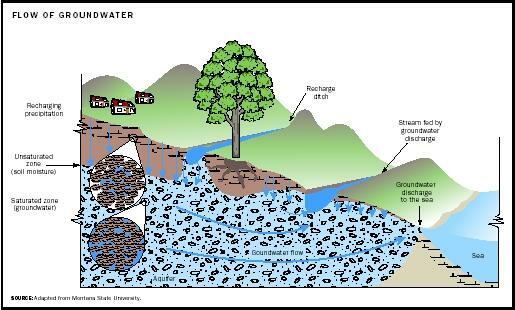 Groundwater discharges naturally into lakes, rivers, oceans, and springs. It is also extracted via pumping wells. Approximately 80 percent of municipal water systems and close to 99 percent of rural residents in the United States rely on groundwater. In total, approximately 51 percent of the U.S. population depends on it for their water supply. The 1986 amendments to the Safe Drinking Water Act requires that well head protection plans be developed by each state to protect the land around municipal water supply wells from contamination. Individuals can help protect groundwater by disposing of household chemicals properly and fertilizing plants in limited quantities and can help conserve groundwater by limiting water use at home by taking shorter showers, not running water while brushing teeth, running dish and clothes washers with full loads, fixing leaky faucets and pipes, and limiting plant watering in the garden. If withdrawals exceed recharge over a long period, groundwater levels fall and aquifiers can become depleted. This results in decreased groundwater discharge and may adversely impact on ecosystems dependent on an aquatic habitat. Excess lowering of groundwater levels may result in land subsidence . In central California, for instance, groundwater withdrawals from 1930 to 1955 for crop irrigation caused approximately three meters of subsidence. In some arid regions (like the Middle East), little groundwater recharge occurs because of low amounts of rainfall and high amounts of evaporation. Ancient groundwater that infiltrated thousands of years ago during climates wetter than those of the present is being extracted via pumping. This practice is termed groundwater mining because groundwater at this location is a nonrenewable resource that is being depleted. SEE ALSO ; P ESTICIDES ; S UPERFUND ; U NDERGROUND S TORAGE T ANKS ; W ATER P OLLUTION . U.S. Environmental Protection Agency (1990). Citizen's Guide to Ground-Water Protection. EPA 440/6-90-004. Washington: U.S. Environmental Protection Agency Office of Water. Alley, William M., Richard W. Healy, James W. Labaugh, and Thomas E. Reilly (2002). "Flow and Storage in Groundwater Systems." In Science Magazine, 296:1985–1990. U.S. Environmental Protection Agency Office of Ground Water and Drinking Water Information Page. Available from http://www.epa.gov/safewater . U.S. Geological Survey Ground Water Information Page. Available from http://water.usgs.gov/ogw .